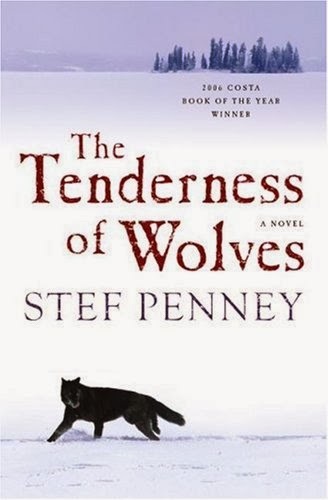 The Tenderness of Wolves by Stef Penney was a 2006 Costa Book of the Year and received a fair amount of critical acclaim. I bought the paperback, and it’s possible it has been on my bookshelf six or seven years. 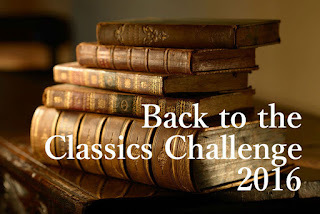 Once again, the TBR pile challenge (hosted by Roof Beam Reader) is helping me to slowly clear the backlog of books I once enthusiastically purchased but never got around to reading. The Tenderness of Wolves is literary historical fiction billed as a mystery. Set in the frigid Northern Territory in 1867, it begins with the murder (a scalping) of a French trapper. The body is discovered by Mrs. Ross (the sole first person narrator). She reports the murder to the town’s most prominent citizen, Mr. Knox. He reports it to the "Company," the fur trading company that has more or less of a monopoly on the dealings in that vast area. The Company sends out a team of investigators to catch the murderer. To Mrs. Ross’s dismay, her seventeen-year-old son disappeared the same morning, making him a suspect. Another suspect presents himself by appearing in the victim’s house, where Mrs. Ross catches him. William Parker, a friend of the murdered man who is also a trapper and who is half-Native American, is immediately arrested for the crime. But not everyone believes he is guilty. Upon his release, he sets off in search of the real murderer, serving as Mrs. Ross’s guide. She is in pursuit of her son. There are numerous subplots wrapped around this basic plot–the search for the trapper’s killer and the question of why he was killed in the first place. Much of the book is told from the third person viewpoints of other characters, alternating with Mrs. Ross’s first person viewpoint, which takes a little getting used to at first, but which serves the book well. Still, despite the fact that the main plot involves a search for a murderer, it doesn’t read like a basic who-dunnit. There are not really clues to follow–not about the murder. There are questions about the various people and their motivations for behaving as they do. There is a mysterious piece of bone with markings on it that brings a separate plot question into the mix that has little to do with the main story. There is also a subplot of two sisters who had gone missing into the woods many years ago. These mini-mysteries intersect with the story of Mrs. Ross and Parker’s search for the murderer, but mainly tell stories in themselves. The novel is heavy on atmosphere. The bitter cold and emptiness of the Northern Territories is emphasized, giving a sense of the loneliness. There is a good deal of examination of the psychology of the numerous characters, making for a read that is insightful, but with a storyline that dragged at times. Not all the subplots were equally interesting, but each contributed something to the whole. This novel was also long-listed for the Orange Prize. The writing is beautiful and it’s one of those sad, haunting novels that, although not exactly enjoyable, is altogether worthwhile. 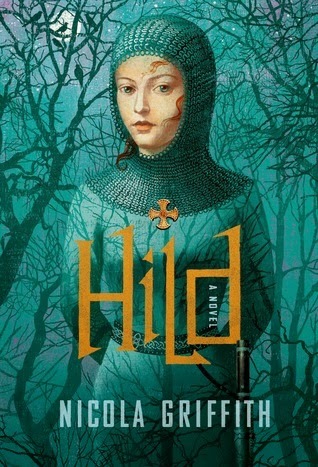 In addition to the TBR pile challenge, this is my 35th book read for the Historical Fiction Challenge hosted by Historical Tapestry. 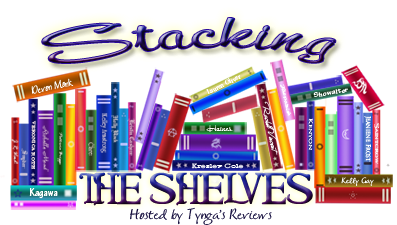 STACKING THE SHELVES: I bought books! I've been on a library binge lately, mainly because I have no room left on my bookshelves. But it's been so long since I've splurged on new books for myself that I couldn't help it. I bought two historical novels. This is an editor's choice in the latest Historical Novels Review. The link is to the review. While you're there, you can check out the HNS website. 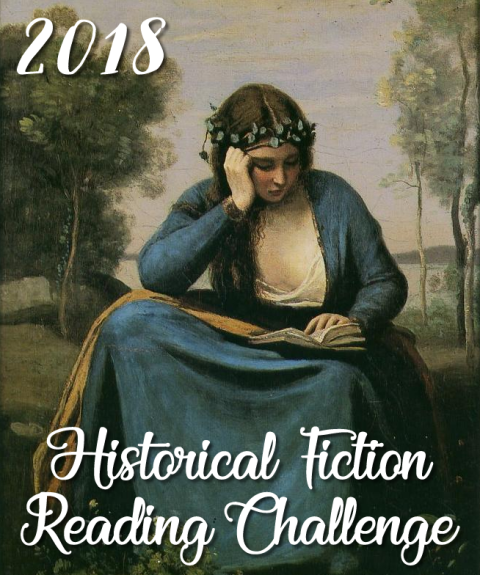 If you're a historical fiction fan, there's no better resource! 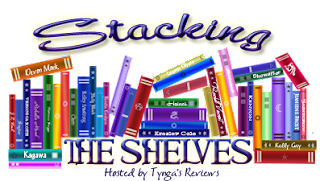 This is my first time taking part in Stacking the Shelves hosted by Team Tynga's Reviews. Look at all the wonderful books people are reading! A Beautiful Truth by Colin McAdam came recommended in my library’s new fiction newsletter. Although it had a ring of "contemporary relationship novel" to it–not my usual cup of tea– the relationships were unique enough to catch my interest and I requested the book. The premise, as I understood from the blurb, was that a chimpanzee, raised by humans, must inevitably be sent to a primate research facility where he would not be able to fit in among his own kind because he had been raised as a human. It would be a story of love, loss, and loneliness, but the twist to make it interesting would be its unusual protagonist. I approached the read with some trepidation because I expected it to be emotionally brutal. However, I didn’t find it draining; instead, it was emotionally rather flat. Other readers have certainly not had that reaction to the book, but I just never did connect with any of the characters, human or chimpanzee. Walt and Judy are an affectionate Vermont couple who discover that they cannot have a baby. Judy is devastated. Walt wants only to see Judy happy, so he manages to acquire a baby chimpanzee for her through means that are shady although not exactly illegal. They raise the chimp as a son, not a pet, naming him Looee. They understand that he is not human, but they expect others to treat him as a part of their family. As Looee grows older and larger, even they have to come to grips with his alarming strength and disruptiveness, so they build a concrete addition to their own house so that Looee can have a place of his own. They spend time with him, but increasingly need time for themselves. Interspersed with this family drama, there are alternating chapters taking us to a primate research facility in Florida. The facility has started as a center for research on primate behavior and psychology. The director worked with language and had taught two of the chimps to recognize symbols for words and even to form sentences to communicate. The book takes us into the heads of the chimps, particularly Mr. Ghoul, one of the chimps involved in the original set of experiments. The author puts words (some made up) into Mr. Ghoul’s head –what he thinks the chimps would be thinking. It’s more or less convincing–convincing to me, but I’m a human. What do I know about what a chimp would actually be thinking? Over time, the facility grows. Its focus expands. There are more chimps with Mr. Ghoul and the director stops trying to get them to communicate with people and now simply studies how they interact with each other. In other areas of the facility, medical testing is going on. Eventually, Looee outgrows his Vermont family. He has become dangerous. The only solution is to send him to a place that knows how to house chimps in a way that is safe for humans. Looee is sent to Florida. It’s a long hard road for Looee. It’s not a pleasant situation for any of the chimps. (Understatement. A section of the book is given over to moralizing about the inhumanity of medical research on animals.) It’s not particularly pleasant for any of the humans in the book either. While I found the whole thing a curious and interesting exploration of the various "what-ifs?" I’m not sure, at the end of it all, what the author’s "beautiful truth" was supposed to be. That we are not so very different from chimps? It isn’t exactly a revelation. 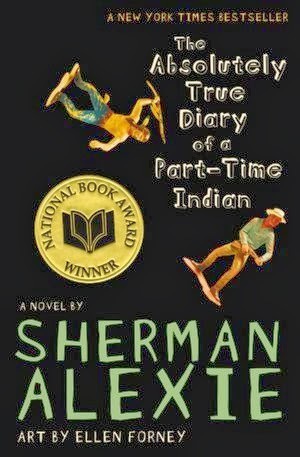 Our next book group book is The Absolutely True Diary of a Part-Time Indian by Sherman Alexie. It’s been on my I-should-really-read-this list for a long time, but it wasn’t something I particularly wanted to read. I’m glad our book group chose it, because I enjoyed it much more than I expected. Junior is an Indian growing up on a reservation in Spokane, Washington, where poverty, alcoholism, and violence are the norm. He is further disadvantaged by having been born with hydrocephalus and a seizure disorder, so he refers to his brain as damaged. However, there is no evidence of that. He’s the smartest kid in his school and a good (coordinated) basketball player. Still, he tells us that he stutters and lisps and wears lopsided glasses. Being skinny and awkward in appearance, he’s a natural target. Despite the many disadvantages of his situation, Junior cannot be kept down. He wants to be a cartoonist (examples included), and he allows himself to dream. When a teacher tells him that there is no hope on the reservation so he has to leave before he is trapped like everyone else, Junior decides to transfer to an all-white school in a neighboring town. Junior’s adolescent male observations on life, love, alcohol abuse, education, basketball, friendship, and true tragedy make this a touching and painful story, but also a hopeful and, at times, a funny one. Junior has a way of bringing out the good in people–sometimes it takes a while, but if there is good, it’ll work its way out. Unfortunately, while there may be an optimistic end in sight for Junior, the overall picture of the reservation life and the people he must leave behind remains bleak. And because it shows us that picture, too, this is an important book. 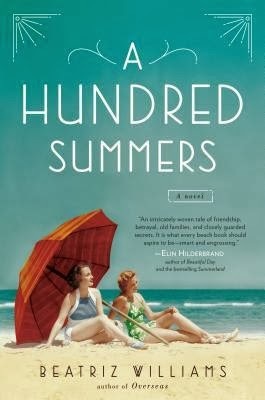 I should have read A Hundred Summers by Beatriz Williams over the summer because it would have been a great beach read. (Or vacation read since I’m not a beach-goer.) But this historical love story set primarily in a vacation community (Seaview) on the beachfront of Rhode Island in the 1930s is enjoyable enough to read any time. The protagonist is Lily Dane, a smart young woman from an elite family who has spent her life summering in Seaview. For most of her life, she had been best friends with Budgie Byrne–outgoing, wild, indulged, beautiful Budgie who makes Lily feel staid and bland in comparison. In 1931, while in college, on a date at a Dartmouth football game, Budgie introduces Lily to Nick Greenwald, a friend of her boyfriend. Lily has been forewarned about Nick–he’s Jewish. This doesn’t matter to Lily, though it will to her parents. For Nick and Lily, it’s love at first sight. The novel flashes back and forth in alternating chapters between 1931 and 1938. A mystery of sorts is unfolding. Because while Nick and Lily’s college romance is rapidly progressing in 1931, leading to a forbidden engagement, seven years later it is Budgie and Nick who appear in Seaview as Mr. and Mrs. Greenwald, newlyweds. Lily is living with her all-but-absent mother and a six-and-a-half-year-old sister, Kiki. The old-line Seaview community does its best to ostracize Nick and Budgie. Nick rarely bothers to make the commute from New York, but Budgie is determined to repair the damage to her friendship with Lily. Even after all this time, Lily is unable to break away from Budgie. Moreover, she is infuriated by the bigotry of those who would shun Nick. And so they slip into the cracks of her world. This is a fun read. The clues to the various mysteries of the relationships are not too deeply hidden, so you can guess what the revelations are going to be. Nevertheless, the story barrels along to an exciting and satisfying conclusion. 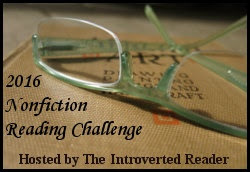 This is my 34th book read for the Historical Fiction Challenge hosted by Historical Tapestry. Burial Rites by Hannah Kent has been receiving wonderful reviews and the plot summary made it irresistible, if a little daunting. As added encouragement, during a quick, curious perusal of the 2013 Best Historical Fiction Good Choice Awards on goodreads, I noticed it was one of the picks. 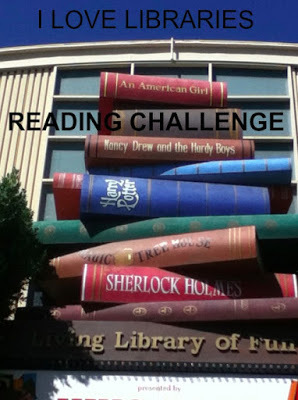 I’ve only read a couple of the nominees: The Painted Girls by Cathy Marie Buchanan and Z. A Novel of Zelda Fitzgerald by Therese Anne Fowler. And I have A Hundred Summers by Beatriz Williams next on my list since it, like Burial Rites, is a library book that can’t be renewed. I won’t vote because I can’t even choose a favorite from among the books I have read and don’t think it would be fair to exclude the ones I haven’t. But I’m pleased to have this list of recommended historical fiction! Burial Rites is a gorgeous but dark story of the last person to be publicly beheaded in Iceland–an execution that took place in the early 1800s. The historical details are meticulously researched, but the woman’s thoughts, words, and, of course, the motivation for her crimes are fictionalized. It is beautifully done. The setting is cold and merciless. The grinding poverty and barrenness of the life of Agnes Magnusdottir (or Agnes Jonsdottir–the unfortunate woman is not even granted the dignity of a solid identity) makes for a relentlessly cruel story. We know she is condemned to die. She knows she is condemned to die. After all, she is a convicted murderess. Agnes, along with two fellow servants, has been found guilty of murdering her master and his guest and then burning down his farm to hide the crime. She is sentenced to be executed, but while awaiting confirmation of the sentence, she is sent to an isolated farm in northern Iceland, essentially to be warehoused. Margret and Jon are the unfortunate couple chosen to be her warders. They don’t want the burden or responsibility, especially since they have two daughters. It isn’t safe to house a murderess, nor do they want their daughters exposed to her influence. But when Agnes arrives–withdrawn, frightened, angry– she is not what they expected. She’s a hard worker. She’s knowledgeable. She’s kind. Agnes is not inclined to talk about what has happened, nor would the family ask. However, a local priest, Toti, has been chosen to be her spiritual advisor, and he coaxes words from her. Eventually, they–and the reader–learn the truth of Agnes’s life and of the two men’s deaths. Does it matter that she has a chance to speak? Does it matter that the truth is told? With all the rumors that have defined her life, will it make a difference to her that someone hears her side? It’s a brutally harsh book and it could be argued both ways. Agnes never stood a chance. But this is a beautiful story about compassion. Maybe Agnes’s story makes a difference in the lives of her warders. Maybe books like this make readers think a little more deeply. I’ll certainly be looking for Hannah Kent’s next book. This book is a historical fiction challenge book. The challenge is hosted by Historical Tapestry. Bullying is certainly not new. However, awareness of the problem has been raised in recent years, particularly as the pervasiveness of social media has made cyber-bullying an increasing threat with the power to devastate young lives. So it is no surprise that YA contemporary fiction is reflecting today’s world with novels centered on teen protagonists who must deal with bullies. 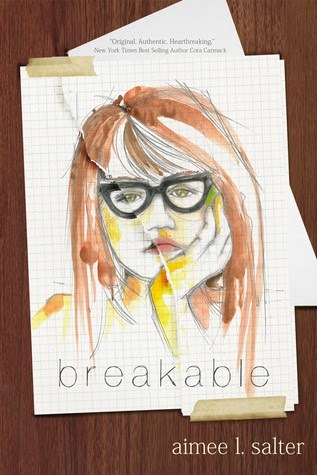 Breakable, a new release by Aimee L. Salter, is a compelling story about seventeen-year-old Stacy, who has been bullied for years by a clique of fellow students who used to be her friends. The daily torment escalates when Stacy’s one remaining friend, a boy named Mark, begins to date one of the worst of the bullies, a nasty scheming girl named Karyn. Karyn is able to hide her true personality from Mark, who is blinded by her pretty face and popularity. Stacy has been quite desperately in love with Mark for a long while. It’s difficult enough that he just sees her as a friend, but when he starts going out with Karyn, it’s more than Stacy can take. Karyn and the rest of the crew are all too aware of Stacy’s feelings and use this as additional ammunition against her. There is one more person in Stacy’s corner. For years, Stacy has been communicating with her future self, "Older Me," whom she can see in mirrors. Stacy relies on "Older Me" to guide her through the impending crisis, but as the bullying spirals out of control, even her future self seems to fail her. Breakable is a fast-paced read with memorable characters. Salter is able to get inside Stacy’s head to show both the emotional frailty and the resilience of a teenager who has been victimized for years but who retains the capacity for a strong and generous love. It’s a heart-wrenching tale of a girl in crisis and a powerful book about the long-lasting effects of bullying. My memory is getting so awful. It’s really true that multitasking on the internet is disastrous for the brain. Somewhere, on some site, some time in the not too distant past, I read a blurb about Dorothy M. Johnson. She died in 1984, so it wasn’t an obituary, but for some reason the article was bringing up Johnson’s writing and the significance of her being a woman who wrote westerns. People told her that women couldn’t, but she persevered, and she wrote some of the best known and most respected western fiction of her day. Perhaps of all time. 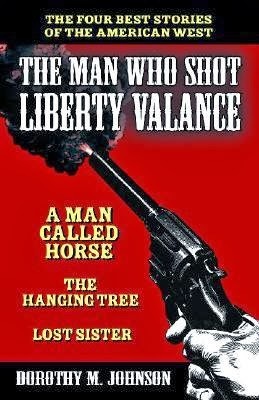 I had never heard of Dorothy M. Johnson, but I had heard of some of her works: A Man Called Horse and The Man Who Shot Liberty Valance. I didn’t know why those titles were familiar–movies probably, because I hadn’t read the stories. (And in fact, looking up the movies, I did see a least a scene or two of A Man Called Horse when I was very young. Some of it was vivid enough to stick in my mind.) But I decided I needed to do the reading. I think the book may have been lost somewhere in the library because it took a long time to find its way to me even though I was the only one on the request list. It arrived at the same time as a particularly large library haul. I put it near the top of the pile because it’s short and then I read it in a few hours. It was a few hours very well spent. The Man Who Shot Liberty Valance. The Great Western Stories of Dorothy M. Johnson is a collection of four short stories including the title story, A Man Called Horse, The Hanging Tree, and Lost Sister. I’m ready to join the choir singing Dorothy Johnson’s praises. The stories are quite perfect examples of the genre with spare prose and straightforward plots that nevertheless manage to kick a little. She recreates the Old West and populates her tales with characters that seem very real, or that seem to be the kind of characters I imagine populated the Old West. I won’t describe the plots of each, but there are gunfights, sheriffs, and prospectors for gold, a man caught by Indians who stays for awhile, and the return of a woman taken captive by Indians when she was just a girl. What happens in these stories is not always what you might expect, but it makes you pause and think. Lately, when I’m looking for something diverting and fun to read, I’ve been turning to Georgette Heyer. Her books are predictable, sure, but her characters are so nicely drawn and the witty banter is always entertaining. I decided I deserved a treat, so I plucked Venetia from my pile of library books and dove in. Venetia is a beautiful, charming, and frank-minded young woman of good family who has reached the unfortunate of age of twenty-five still unmarried. She lives a secluded life in the country since her father was a selfish recluse who refused to tolerate company after the death of his much-loved wife. (Venetia was young when her mother died and barely remembers her.) Venetia has an older brother, Conway, who escaped first to the university and then to the army. She also has a younger brother, seventeen-year-old Aubrey. Aubrey is extremely intelligent and scholarly but has "a weak hip" and a pronounced limp. The upshot of all this is that upon the death of her father, Venetia was left running the family estate and caring for her brother until such time as Conway saw fit to return to his responsibilities. In three years, Conway has not seen fit to return. This leaves Venetia in an awkward situation with regards to her future. Her father had never allowed her to venture out into company and he received almost no visitors. He did not let her go to her aunt’s home in London for her coming-out season. So, Venetia remained at her manor (Undershaw) to be courted now by the only two eligible men in the town: a rather ridiculous boy several years her junior who fancies himself a romantic hero and a pompous, self-righteous friend of the family named Edward Yardley, who considers her his property already. Venetia’s only other alternative is to wait for Conway’s return and then set up housekeeping for herself somewhere with Aubrey. This is actually what Venetia, who is shockingly independent, prefers, though no one can believe it. And then, one day, while out picking blackberries on her ever-absent neighbor’s property (The Priory), she stumbles across the neighbor who–embarrassingly--isn’t absent. Lord Damerel is a rake with a terrible reputation. At their first meeting, he demonstrates what a true scoundrel he is by grabbing her and kissing her. (He thinks she’s one of his tenants–as if that is an excuse. But apparently it is.) Venetia is scandalized, but she’s a lot more open-minded than her neighbors and what she has seen intrigues her rather than putting her off. Damerel is more than intrigued by Venetia and resolves to prolong his stay in the country. A few days later, Aubrey suffers a riding accident and Damerel happens to rescue him. This provides the opening for Venetia to visit the man who is shunned by everyone of her acquaintance. In a short while, she and Damerel and Aubrey are fast friends. The reader can see where this will eventually lead. Damerel will be reformed by the innocent Venetia without losing any of his rakish appeal. 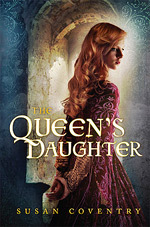 Venetia will grow wiser in the ways of the world without losing any of her innocent charm. And this is Heyer, so while illicit liaisons are alluded to in the broader world, the romance between the hero and heroine does not move to the bedroom. Despite knowing in advance how everything will end, the pleasure of reading the book is seeing how it gets where it is going. Venetia has a delightful cast of characters. I enjoyed whiling away the hours following the twists and turns of the relationship between the not-so-jaded-as-he-imagined-himself-to-be Lord Damerel and the not-so-green-as-everyone-thinks-she-is Venetia. I'll add this to my historical fiction challenge list. The challenge is hosted by Historical Tapestry. 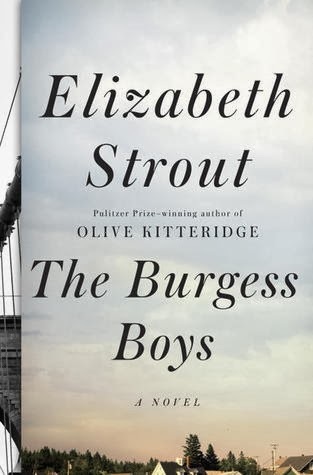 Elizabeth Strout writes some painfully insightful contemporary fiction. I loved Olive Kitteridge, despite its rather bleak and lonely portrayal of its New England cast of characters. Abide With Me also impressed me. (But I confess after looking back at my review that I’m having trouble remembering details of the plot.) So I put my name on the library waiting list for The Burgess Boys as soon as it came out. The topic is not one that would normally have called out to me. It falls into the category of "contemporary dysfunctional family," but I wanted to read whatever Strout wrote next. In the prologue, a writer and her mother gossip about a troubled family from their hometown in Shirley Falls, Maine. Somewhat estranged themselves, recounting the troubles of this other family is one thing that brings them together. The writer eventually decides to tell the story of this family, the Burgesses, although she is a little concerned about what people will think of her for writing a book about people she knows. It’s an odd jumping off point for the story and seems a little unnecessary. In fact, the superfluousness of the prologue made me think that there really must be some sort of literary significance to it. Maybe the point is that we are all a little voyeuristic about other people’s lives and tend to use stories of other peoples’ troubles to diminish our own problems the way the narrator and her mother do. Or perhaps the point is the more obvious one that the narrator’s mother makes: nobody ever knows anyone. But Strout works very hard to get us to know the Burgesses. The story itself is an interwoven tale of painful sibling dynamics, marital woes, and social dysfunction, peppered through with tiny (very tiny) rays of hope. The title is a bit of a misnomer. There are three Burgesses, two boys and one girl. Jim Burgess, the eldest, is the leader, the rock of the family. He possesses a certain charisma that wins people over, but the reader, who gets to see through him, is not so easily won. He has grown up to be a wildly successful defense lawyer. The twins, Bob and Susan, are a few years younger. Bob has tried all his life to emulate Jim. He’s a lawyer as well, but he works for the legal aid society. He has not achieved Jim’s financial success or, for that matter, any of Jim’s admirable stability. Bob is practically an alcoholic. Yet Bob is, we are made to understand, actually a nice guy for all his ineffectiveness. Both men have escaped Maine and now live in New York City. Jim is married to a wealthy Connecticut woman named Helen. They are recent empty-nesters. Bob, childless, is divorced from Pam, but remains on friendly terms with her. The female sibling, Susan, has stayed in Shirley Falls where she works as an optometrist. Her husband abandoned her and their awkward son, Zachary, now a teenager. Susan is embittered, lonely, and "no longer pretty" as everyone is quick to point out. None of the siblings is particularly happy. A tragedy in their past may be the reason or it could be that all Strout’s characters are basically discontent. But the Burgesses do have a whopper of a history to account for their underlying maladjustment. While young, they suffered the loss of their father in a horrifying accident. The three children were playing in their car at the top of the hill. The four-year-old Bob messed with the gears and the car rolled down the hill and killed him. And while no one blamed him, and no one ever speaks of the accident, poor Bob carries that burden around with him. And the siblings did and do blame him. The story begins when Zachary (Susan’s teenage son) tosses a pig’s head into a mosque in Shirley Falls during prayers during Ramadan. He has no real reason for doing this beyond a vague hope for some attention from his absent father. Zach is a very lonely, depressed boy. However, Shirley Falls is experiencing some racial tension and a clash of cultures. Although the Maine town prides itself on being warm, welcoming, and liberal, an influx of Somali refugees has tested them and found them wanting. Many of the inhabitants are more strongly prejudiced than they want to admit. Zach’s stupid act is interpreted as a hate crime. Susan summons her lawyer brothers home to Maine for support. A hornet’s nest is stirred up as old patterns of sibling interaction are revived and intensified. 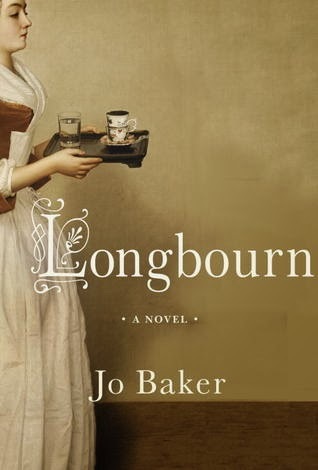 Strout is at her best with character sketching and making people seem very real, very large warts and all. Although it is difficult to like any of the siblings or their spouses, it is possible to understand and sympathize with them. The plotting of the book is somewhat predictable and is not the strong point, although the story did hold my interest throughout. The book deals with some ambitious themes and may be trying to do too much. But the pictures Strout draws of the bonds between the siblings that ultimately, despite their dysfunction, are strong enough to carry them through the bitterest trials, make this a satisfying family drama.